Our company motto is “Always One Step Ahead” reflecting our strong belief that, by being better prepared and aware of workplace hazards, we can potentially avoid them. It’s our mission to foster that attitude in our customers and help to create a more productive and happier workplace for everyone. Globally, workplace accidents are a major economic and social issue. In the United States, it is estimated that the cost to industry from these accidents and injuries exceeds 200 million US$ annually, while in the United Kingdom, the overall cost to the economy has been calculated to be nearly 5 billion GBP per year*1. Asia Create is at the forefront of developing innovative safety simulation technology providing solutions to help combat the economic and social costs of workplace accidents and injury. 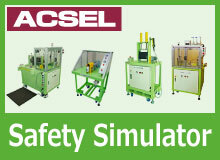 Our “ACSEL” Safety Simulator Machine series have been in production since 2005 with more than 50 types of Simulator Machines installed in leading manufacturing companies throughout Japan and exported globally to manufacuring companies throughout South East Asia and the United States of America. Here are some examples of the Safety experience Training Machines that we designed. 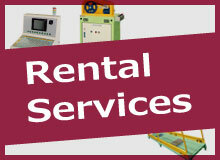 Each product is our original since we produce equipment to meet the onsite conditions of each customer. Using this device, people can understand that a small spark could create a large explosion and actually feel the impact from the reaction. This device simulates the effectiveness of wearing safety shoes when a worker drops heavy items onto their feet. This simulator discharges static electricity at the organic solvent benzene to let you see it catching fire.